Soma-Max - it is somatropic hormone (somatotropin, HGH, STG) got this name due to the fact that in medicine it is used as a means to increase growth in children, adolescents and people up to 22-25 years old, with more growth areas closed in bones. Acceleration of growth occurs due to an increase in the long tubular bones of the limbs. 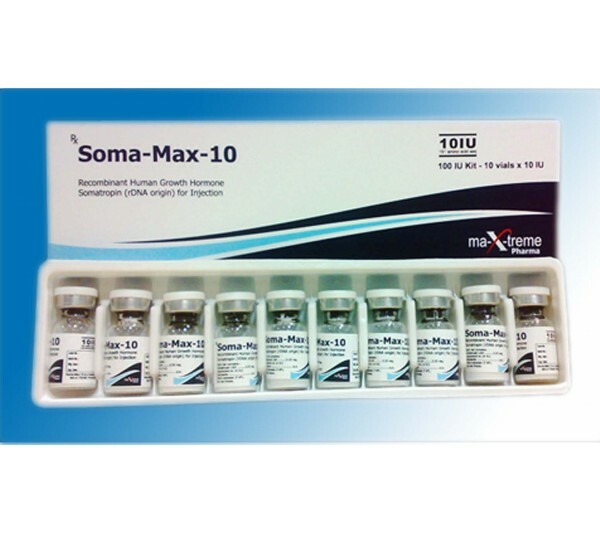 Soma-Max - a peptide hormone that is produced by the anterior part of the pituitary gland, consists of 191 amino acids, has a wide spectrum of action. It has a strong anabolic and anti-catabolic effect, increases protein synthesis, burns fat and prevents the destruction of muscle mass. It promotes hyperplasia, an increase in the number of muscle cells, this is one of its unique properties, which is simply impossible to achieve without its presence in elevated concentrations in the blood. Increases bone mass, even if the growth zones are closed, the bones will continue to grow no longer in length, but in thickness. Soma-Max is a recombinant analogue of the endogenous (that is, the one that is produced by our body on our own) growth hormone, with the formula absolutely identical to human somatotropin. Recombinant means obtained by genetic engineering in the laboratory. This process is rather complicated and expensive, growth hormone is synthesized by special E. coli bacteria, but its chain contains an additional methionine residue, which must be cleaved to obtain the desired amino acid sequence. It is in the cleaning that the main high cost of this type of production lies.